This segment comes from Episode 1: War + Peace. From Jesus’ command to “love your enemies” to the idea of “holy war” is a giant leap. Yet from the Old Testament through to the Crusades and the inquisitions, Christian history is full of violence. Has Christianity been a major contributor to war? How have the followers of a crucified leader managed to get things so wrong? And what difference has it made when they have followed his example of peace-making and non-violence? This segment looks at how Martin Luther King Jr and others followed this example of non-violence in the 1965 Selma to Montgomery marches in Alabama. 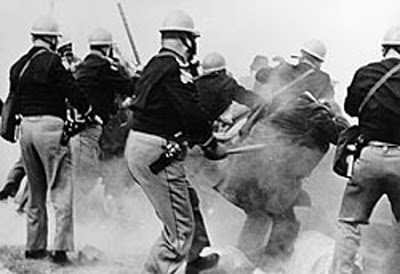 The Selma to Montgomery marches of 1965 showed how effective peaceful resistance can be. SIMON SMART: By 1964 social change was slowly flowing toward the American South. The Civil Rights Bill had been passed, but it hadn’t delivered what it promised, and violence trembled just below the surface. Would things continue to go the way of Martin Luther King and his peaceful resistance? Or would African-Americans, impatient for change, respond to the segregation, the bombings, the killings, by unleashing a bloodbath of their own? People who are advocates of nonviolent resistance will tell you it’s not about being passive. They actively seek confrontation. And in 1965 King and his followers thought there’d no better place than Selma, Alabama, to drag the darkness of racial oppression out into the light. Alabama’s racist administration, led by the notorious Governor George Wallace, and Sheriff Jim Clark, could be relied upon to react to any attempt by Black Americans to assert their place in society. So, on March the 7th, 1965, more than 500 protesters gathered here to begin a peaceful march to Montgomery to demand their voting rights. This is the Edmund Pettus Bridge. It’s named after a Confederate General in the American Civil War and a U.S. Senator, who also happened to be a Grand Dragon of the Alabama Ku Klux Klan. The bridge was a symbol of the South’s determined racism, and a fitting place to make a stand. But for protestors, it would prove to be a formidable barrier. Waiting for them on the other side was a line of State Troopers armed with whips, and clubs, and tear gas. ARCHIVE: “This is an unlawful assembly. You are to disperse. You are ordered to disperse. Go home or go to your church. I’ve got nothing further to say to you”. SIMON SMART: It was a horrifying spectacle, as even old men and women were beaten senseless. Photos of 54-year old Amelia Boynton unconscious on the bridge went around the world. The day became known as Bloody Sunday. ALBERT J. RABOTEAU: One of the things about Selma and the resulting marches was that they displayed on nationwide TV the brutality of white racism against the bodies of black people. So, the beating at the Edmund Pettus Bridge was shown on television. When people see images (pictures or live images) of the water cannons turned on children, or the police dogs biting unarmed protestors, what happens is people say, “Is this America? How can this happen?” It calls into question our national identity, the notion of our exceptionalism. Yeah, America is exceptional all right. It beats its black people. SIMON SMART: The outcry was immediate. Martin Luther King called on clergymen and citizens from around the country to come and join with the protestors. Two days later, a large, eager crowd assembled and started across the bridge. They got about halfway across, and I’m sure plenty of them were thinking about what had happened to the last group that attempted this. But then King stopped and they all knelt down and prayed. ARCHIVE: [Trooper] “I’m asking you to stop. This march will not continue. Stand where you are”. 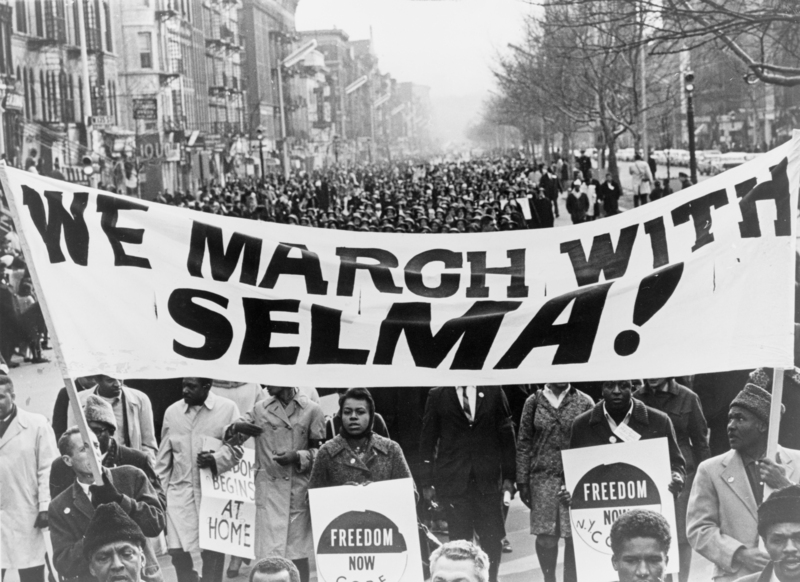 SIMON SMART: Then, obeying a federal court injunction, King led them back to Selma. That night three white ministers who’d responded to King’s call were attacked, and one of them killed. But the protesters remained undeterred. MARIA J. STEPHAN: Significant violence was used against the protesters and they kept going. And people often ask, “How did you maintain nonviolent discipline in this moment?” And a lot of that can be explained by, yes, the spiritual resources, the commitment to nonviolence, which was articulated by leaders like King and others, and the participants had been trained in how to maintain nonviolent discipline in these difficult situations. So, in the basements of churches, there were trainings in how to do civil disobedience, non-violent direct action, and how not to respond to violence with violence when provoked. And so these combinations of the spiritual and the practical strategic really came to bear in the Selma march. WILLIAM CAVANAUGH: God identifies with the victim of the scapegoating rather than the victimisers, and then it becomes obvious to everyone where the injustice lies, that what passes for order is not really order at all. And I think Martin Luther King did exactly that, he kind of brought bodies out into the streets, and when they got clubbed it became obvious to see on whose side justice really was. And that, I think, is a kind of enactment of the story of Christ. SIMON SMART: On March 21, a federal court ruled that protestors had the right to march. Alabama Governor George Wallace refused to guarantee their safety, but President Lyndon B. Johnson vowed he would provide protection. King and 8,000 others once again began the March from Selma to Montgomery. It must have been exhilarating to be finally out on the road. There’s still quite a long way to go, but there was a real sense of anticipation about what might be achieved. The number of protesters continued to swell, flanked by 2,000 U.S. soldiers, 1900 members of the National Guard, as well as FBI and Federal Marshals sent by President Johnson. By the time they arrived here at the state capital building, their numbers had swelled to around 25,000 people. They were part of a sea of humanity, and they’d won not only the right to march, but finally, voting became a reality in the South. On every level, this was an overwhelming, peaceful victory. 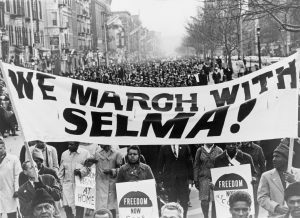 The Voting Rights Act of 1965 was passed in August, and by March 1966, in Selma alone, nearly 11,000 black voters were registered. 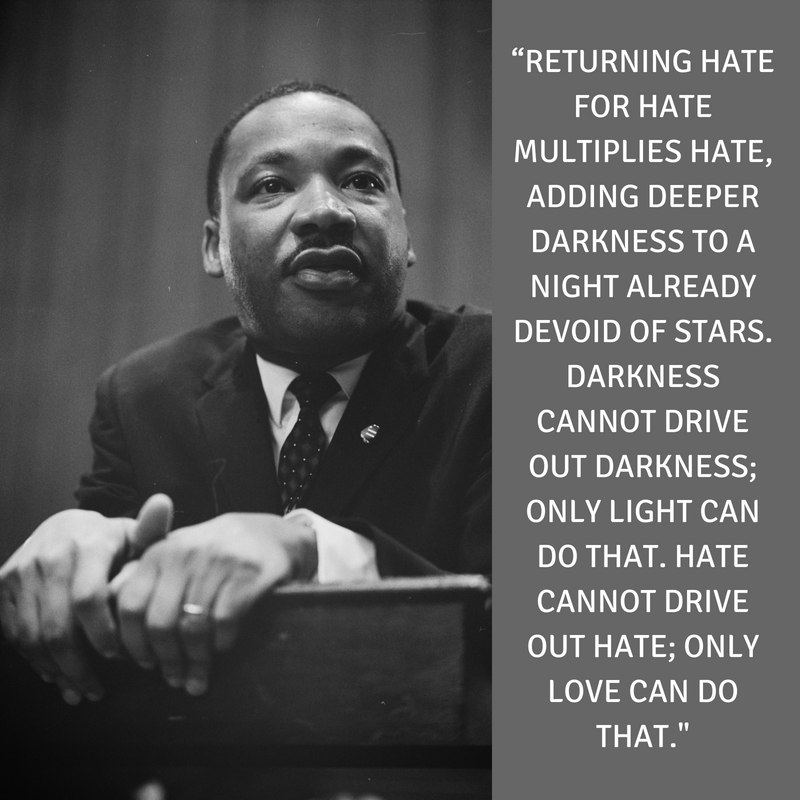 Martin Luther King operated on the conviction that the ultimate victory had already been won by Jesus, and non-violence was part of following him, or “bearing his cross”. He knew that this would involve a certain degree of suffering, but he was sustained by a profound sense that the Promised Land waited ahead. Which of the following responses do you believe to be most accurate? Explain your response. Can you think of a cause that is important to you that you would march for? Why would you march for this cause? Would you still march if there was a very real possibility of injury or death? Why or why not? 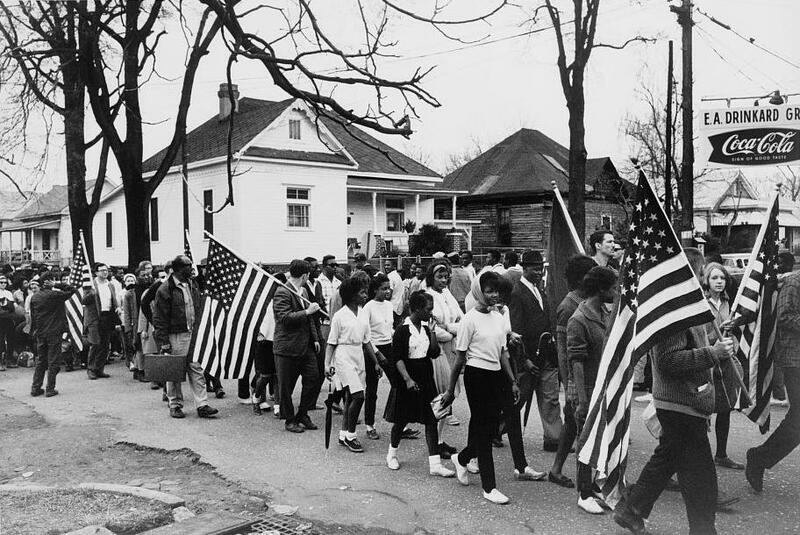 What observations can you make about the following images related to the 1965 Selma to Montgomery Marches? 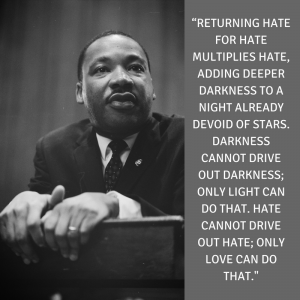 What is your reaction to this quote from Martin Luther King Jr? Context: Read this timeline of the Civil Rights Movement in the United States to see where the Selma to Montgomery marches fit in. Find a one-sentence definition of the following terms. Draw an image that represents the kind of discrimination African-Americans faced in Selma, Alabama in the early 1960s. Why did Martin Luther King Jr and his followers choose Selma as the place to begin their march for voting rights? What role did television play in creating an outcry against the brutality on the Edmund Pettus Bridge? What is striking about the actions of the protestors in the face of extreme opposition? Maria J. Stephan says that the “combination of the spiritual and the practical/strategic” resources enabled the protestors to maintain non-violent discipline. Explain what she means by this. What did the march ultimately achieve? Explain what motivated and sustained Martin Luther King Jr.
How did people in the Samaritan village react to news that Jesus would be passing through? How did James and John react to this? How did Jesus respond to James and John’s question? What might this show us about Jesus’ attitude towards violence? What did Jesus’ enemies want to do to him? What overall picture do we get of Jesus from Isaiah’s prophecy? What might this prophecy tell us about how Jesus would respond to violence (in particular v.19)? Imagine you have been asked to run a basement training session in non-violent resistance. 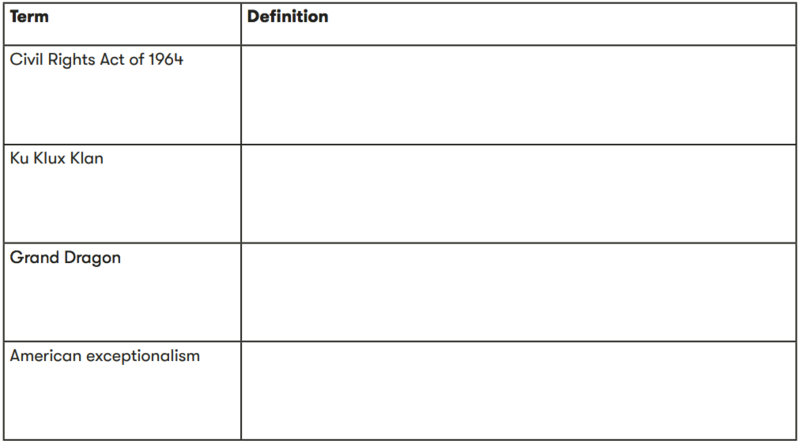 Write an outline of the structure of your training session, drawing on themes from today’s lesson. Think of a potential situation in your life where you could either choose to respond to someone with hostility and anger, or with love. In pairs or small groups, role-play these two potential responses – including what might happen next in each case! Listen to CPX’s podcast episode “The long shadow of slavery” from 17.29-19.13. What difference does it make when those who are not directly affected by injustice stand alongside those who are? How might you be able to do this in your own life? Read the speech Martin Luther King Jr gave upon arriving in Montgomery at the end of the Selma-Montgomery march. Make a list of all the biblical references and allusions you can find.